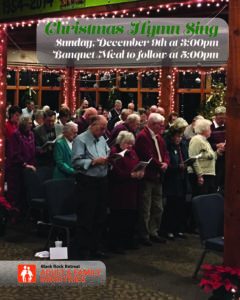 Join us in the Maranatha Retreat Center Lobby on Sunday, December 9th at 3pm as we welcome in the holiday season with our annual Christmas hymn sing. The hymn sing and light refreshments are free to all guests and do not require reservations. A Christmas buffet dinner will be offered at 5pm which does require reservations. Meal prices are as follows: Adults $17, Children (ages 5-12) $10, and Children (ages 4 and under) $0.